The authors began writing the First Edition of this textbook in early 1988. It took almost 10 years to complete this effort, because they did not want to write an ordinary textbook. Their goal was to write a book that would break new ground in both the understanding and explanation of finance and its practice. They wanted to write a book that would influence the way people think about, teach, and practice finance. A book that would elevate the level of discussion and analysis in the classroom, in the corporate boardroom, and in the conference rooms of Wall Street firms. They wanted a book that would sit on the shelves of financial executives as a useful reference manual, long after the executives had studied and received a degree. They were successful in their endeavor. 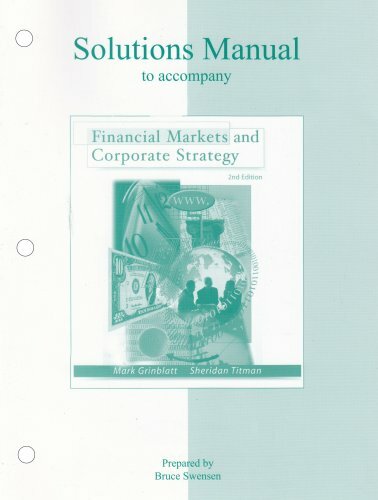 The success of the first edition of Financial Markets and Corporate Strategy was very heartening. The market for this text has expanded every year, and it is well-known as the cutting edge textbook in corporate finance around the world. The book is used in a variety of courses, both for introductory courses and advanced electives. Some schools have even changed their curriculum to design it around this text. The authors have developed this Second Edition based on the comments of many reviewers and colleagues; producing what is a more reader-friendly book. The most consistent comment from users of the first edition was a request for a chapter on the key ingredients of valuation: accounting, cash flows, and basic discounting. This ultimately led to a new chapter in the text, Chapter 9, which is currently available in the "Sample Chapter" section of the book's website. In almost every chapter, examples are updated, vignettes changed, numbers modified, statements checked for currency and historical accuracy, and exercises and examples are either modified or added to. The goal of the Second Edition is to make the book ever more practical, pedagogically effective, and current. Examples have been updated, vignettes changed, numbers modified and statements checked for currency and historical accuracy, and exercises and examples have been modified or added to so that the text is even more practical, pedagogically effective and current. Very practical text, with many real world examples embedded throughout. Each chapter opens with a real-world vignette to motivate students to learn the issues in the respective chapter. Each chapter includes a set of learning objectives to help the student understand what should be learned and mastered from each chapter. Virtually every chapter includes numerous examples and case studies, some hypothetical and some real, that help students gain insight into some of the most interesting and sophisticated realms of financial theory and practice. Major results and key words and concepts are highlighted throughout each chapter. In addition, the functional use of color is deliberately and carefully done in order to call out important topics. Practical Insights is a feature that contains unique guidelines to help students identify the important practical issues faced by the financial manager and where to look in that part of the text to help analyze those issues. This feature enables the book to serve as a reference as well as a primer on finance. Practical Insight boxes are located at the end of each of the six parts. Executive Perspective feature provides the reader with testimonials from important financial executives, who have looked over parts of the book and highlight what issues and topics are especially important from the practicing executive's perspective. Examples include Myron S. Scholes, Thomas E. Copeland, David C. Shimko. These are also found at the end of each of the six parts, just after the Practical Insights feature. Increased accessibility through careful topic selection (both deletions of content as well as additional new content). A new brief section on private equity in Chapter 3, Equity Financing. Some of the more difficult mathematical material has been cut, and made less intimidating by using narrative discussion vs. mathematical formulas, such as chapter five's discussion of mean-variance analysis. Chapter 7 includes a new discussion about the lessons learned from the fate of Long Term Capital Management. It also includes a section about market frictions and their implications for derivative securities pricing and the management of derivatives portfolios. Chapter 8 includes an expanded section on covered interest rate parity. Chapter 10 provides a more in-depth discussion of the equivalent annual cost approach and has several new results. Chapter 11 has an expanded discussion of the distinction between firm betas and project betas and provides several new explanations for why these might differ. Mark Grinblatt, University of California at Los Angeles, Ph.D. Yale Mark Grinblatt is Professor of Finance at UCLA’s Anderson School, where he currently serves as chair of the Finance area, and where he began his career in 1981. He is also a director on the board of Salomon Swapco, Inc., a consultant to numerous firms, and serves as an associate editor of Journal of Financial and Quantitative Analysis. From 1987 to 1989, Professor Grinblatt was a visiting professor at the Wharton School and while on leave from UCLA in 1989 and 1990, he was a vice-president for Salomon Brothers, Inc., valuing complex derivatives for the fixed income arbitrage trading group in the firm. Professor Grinblatt is a noted teacher at UCLA, having been awarded teacher of the year in 1993 for UCLA’s Fully-Employed MBA Program by a vote of the students. This award was based on his teaching of a course designed around early drafts of this textbook. Professor Grinblatt’s areas of expertise include investments, performance evaluation of fund managers, fixed income markets, corporate finance and derivatives. Sheridan Titman, University of Texas at Austin, Ph.D. Carnegie Mellon Sheridan Titman holds the Walter W. McAllister Centennial Chair in Financial Services at the University of Texas. He is also a research associate of the National Bureau of Economic Research and a consultant to a number of firms. Professor Titman began his academic career in 1980 at UCLA, where he served as the department chair for the finance group and as the Vice Chairman of the UCLA management school faculty. He has designed executive education programs in corporate financial strategy at UCLA and the Hong Kong University of Science and Technology, based on material developed for this textbook. In the 1988-89 academic year Professor Titman worked in Washington, D.C., as the special assistant to Assistant Secretary of the Treasury for Economic Policy, where he analyzed proposed legislation related to the stock and future markets, leveraged buyouts and takeovers. Between 1992 and 1994, he served as a founding professor of the school of Business and Management at the Hong Kong University of Science and Technology, where his duties included the vice chairmanship of the faculty and chairmanship of the faculty appointments committee. From 1994 to 1997 he was the John J. Collins, S.J. Chair in International Finance at Boston College. Professor Titman’s areas of expertise include investments, performance evaluation of portfolio managers, corporate finance and real estate. He is an editor of the Review of Financial Studies and serves on the board of a number of other finance and real estate journals. He is a past director of the American Finance Association and a current director of the Asia Pacific Finance Association.